I'm looking for some good books for a newbie salty like myself. Can anyone recommend some good books on setting up a reef aquarium, fish species, coral etc. ? This will be my first marine tank so I'm after good info for beginners, but also a good book that will still be useful as my knowledge grows. Are any of these books worthwhile? Last edited by Loa; 14-10-2006 at 05:22 AM. Second one gets good write-ups, not read the others. The third one is by Bourneman? He is good. Tullock's "Natural Reef Aquarium" is good IMO. Knopf's "Art of German Reefkeeping"(?) small but packed with very good and concise information - he is the editor of Coral Magazine. Delbeek & Sprung's 3 volumes are very good too esp Vol 3. It seems like The Conscientious Marine Aquarist, gets a lot of praise, so I might have to put it on the short list. Also checked out Delbeek & Sprung's books, and as you said the 3rd volume looks very useful. Borneman seems like a good source for info on corals. Thanks. It seems like I'll definetly have to get that one then. I can highly recommend Tullock having recently finished it, now im looking for a book on corals! Nice and affordable at that. But what the hey, I'd rather spend a bit of money on books than waste even more money on a failed reef aquarium. Thats my philosophy on this subject!! Especially when its wasting thousands of pounds! Plus I feel if i can read lots of books, do all my research and planning, and im still really into it, its definately the way to go. TBH the third book by Sprung and Delbeek is the one to buy before spending any money on a serious tank. Expensive, but they pretty much collect the entire wisdom on setups and explore the setup, pros and cons of each idea. They give an educated and objective view on each, which is very useful. It covers filtration, lighting, heating, the lot. Most definetly! Really, it is a long term investment too, since some of the fish can live so long and your corals will probably outlive you if you do right by them. 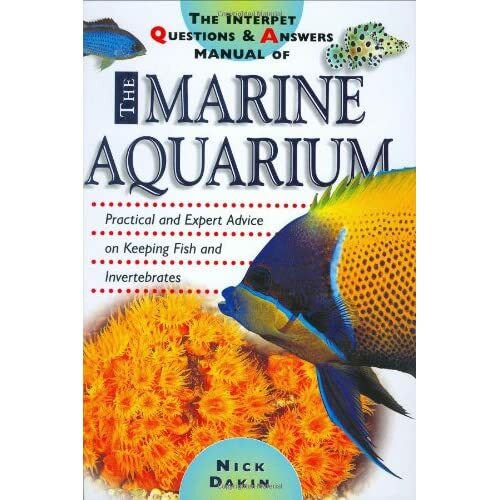 this one is pretty good - sometimes the "The Conscientious Marine Aquarist" have almost too much, but this one gives u a Q and A section on all of the basic's, very good. Yeah, I was thinking that myself when I was looking at it. It seems to cover all the possible setups etc. giving good information on your options. This is Delbeek & Sprung's 3rd volume tis it not? Yep! Worth it for the picture of the 2m tank full of sun corals that gets fed 100g of frozen mysid A DAY!